The difference between microprocessor and microcontroller have always been confused with one another. Each of them are designed for real time application. They share several common features and at the same time they have some variations. These IC’s cannot be distinguished by observing them. They are available in several versions ranging from pin-6 to as high as 80-100 pins. Before aiming to the difference between microprocessor and microcontroller, let’s see the brief introduction of microprocessor and microcontroller. The short term of the microprocessor is uP, and it is a central processing unit. A Microprocessor is used to make many tasks like arithmetic and logic operations, system controlling and storing the data, etc. It will process the I/O peripheral data and gives the results back to the peripherals to function. In the year 1968 the first microprocessor was developed by Garrett Research’s .But, the commercial microprocessor was released in the year 1971 which is termed as 4004.The block diagram of microprocessor is shown below. If a processor desires to process an instruction from memory or a request from the I/O, it has to induce instruction through a bus from the memory or I/O, Place it within the registers and process it within the registers. The Processor will save the result in the memory through the bus. However, this architecture has some drawbacks. It is slow and knowledge operations cannot occur at an equivalent time as a result of them share an equivalent common bus. Later, Harvard design is developed. 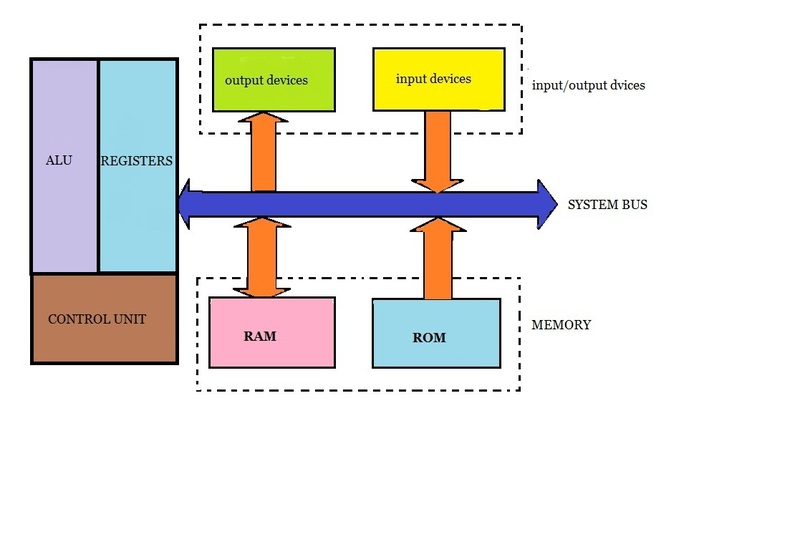 In the Harvard design the information memory and program memory are placed as separate memory and separate buses are connected to communicate with one another. There are two kinds of central processing unit small programming and hardwired programming. Microprogramming is slow in comparison to hardwired. Hardwired implementation is principally of logic gates and passive elements. Code is employed within the microprogramming. CISC: CISC was first instruction set architecture. In the CISC instruction set, instructions will take long time to execute; which may contain of opcode addressing mode and operand, etc. The execution speed will be slow. The best example is X86 architecture. RISC: In the RISC (reduced instruction set computer), the instruction set will be small & execution speed will be fast. The implementation of this instruction is simple and does not require complex architecture. This is widely used in many embedded systems applications. 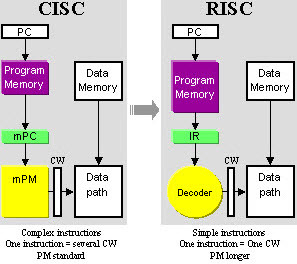 POWERPC and SHARC use RISC. 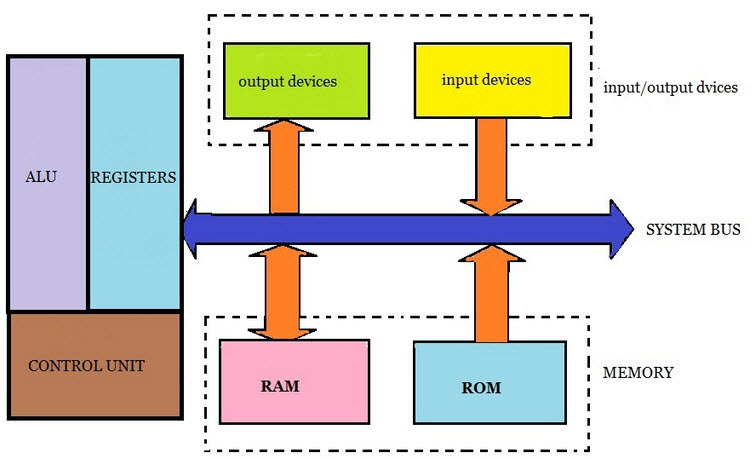 Microprocessor should be selected according to the application and peripherals. RISC cannot be used for large applications and CISC cannot be used for small applications. 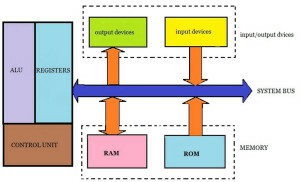 Take a closer look at the block diagram of the microprocessor, it has several support devices like ROM, Read write memory, timer, serial interface, I/O ports, etc.All these support devices are interfaced to the microprocessor through a system bus.So finally we can conclude that all support devices in a microprocessor are connected externally. 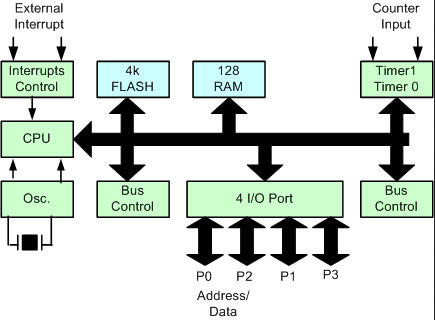 The system bus consists of an address bus, control bus and data bus. A microcontroller is a computer on a chip in which many support devices like RAM, ROM, timers, counters, I/O peripherals are fixed in one IC. 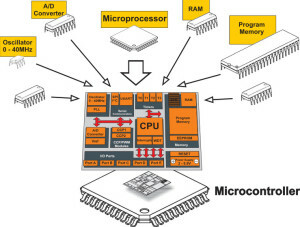 Most of the microcontrollers uses RISC architecture. But, some microcontrollers like 8051, Motorola uses CISC architecture. Microcontrollers is mainly designed to control specific electronic applications. 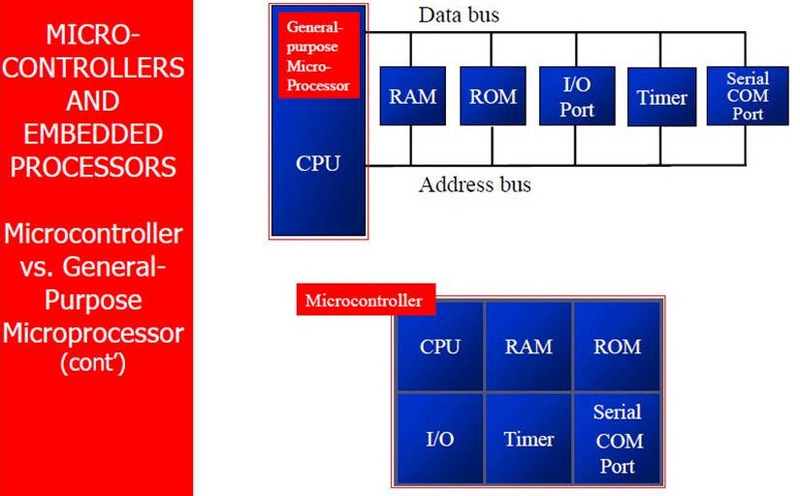 The short term of the microcontroller is MCU or uC. Microcontroller is a heart of an embedded system.Microocntroller can be easily interfaced to external peripheral devices like ADC, DAC, serial ports, Bluetooth, Wi-Fi, etc. The interfacing procedure of the microcontroller is very fast. Examples of the microcontrollers are microchip’s PIC, Intel’s 80196, The 8051, Motorola’s 68HCxx. Microcontrollers are normally found in toys, office machines, automobiles, home appliances, etc. The applications of microcontrollers involve in various embedded system projects and electronics projects. 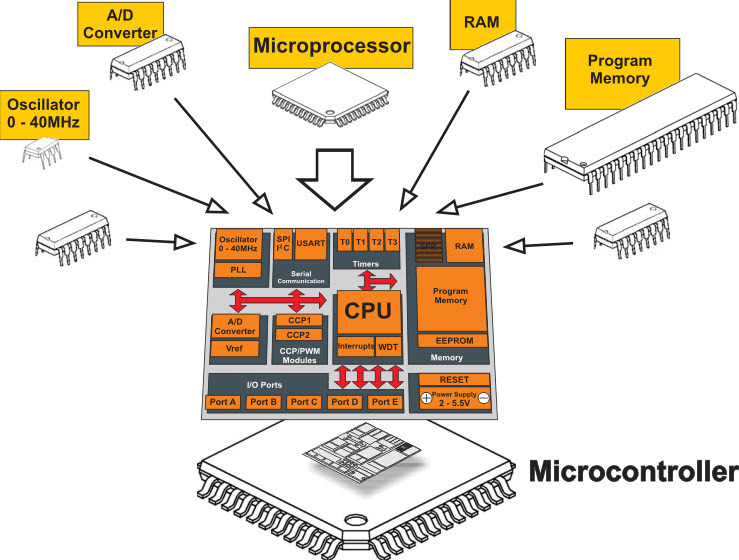 The comparison between microprocessor and microcontroller are discussed below. Most of the microprocessors uses Non-Neumann architecture and CISC architecture.But some microprocessors use RISC and Harvard architectures. Whereas microcontrollers uses Harvard and RISC architectures. But some microcontrollers like SHARC and 8051 uses CISC architecture. In a microprocessor, a number of peripherals are placed on a board and connected via buses. But in the microcontrollers, these peripherals are combined in a single IC. Protection of the microcontroller is high compared with microprocessor. Because, when the microcontroller is dumped with a program it is very difficult to retrieve the program from the ROM by other users. Whereas in microprocessor, it doesn’t give much protection to its program. The cost of the microcontroller is low compared with microprocessor based systems. Most of the microcontroller based systems are compact systems. The applications of the microprocessors mainly include defense systems, computation systems and n/w communications, etc. Microcontrollers are used in embedded systems applications such as cell phones, watches, mp3 players, microcontroller based projects etc. This is all about the difference between microprocessor and microcontroller, microprocessors cannot be replaced by microcontrollers. Because, both of them have a unique way of usage in the development of applications. Furthermore, any queries regarding this concept please give your feedback by commenting in the comment section below.Here is a question for you, what is the jump range in 8051 microcontroller?